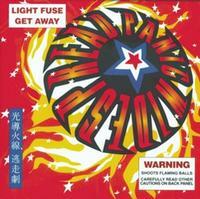 Light Fuse, Get Away, the first live album released by the Athens, GA, based band, Widespread Panic, documents the band's estimable onstage powers. It was first released by Capricorn Records on April 12, 1998. It would later be re-released in 2001 by Zomba Music Group. The album was recorded over various concerts by the band in 1997. "Pickin' Up The Pieces" featured Branford Marsalis on saxophone and was recorded on September 7, 1997 in Boston.